A seasonal stream impacts an environment in a matter of minutes, carving a channel through the dirt and invigorating dehydrated flora and fauna. In March 1926, observers in Walla Walla, Washington spent six days watching the Burlingame Canyon form out of loose soil and gravel. Given a few million years, the Colorado River managed to carve the Grand Canyon – which measures 277 miles long, 18 miles wide, and more than one mile deep – from solid rock. Water is powerful, and the longer you let it work, the more damage it can wreak. In homes, water damage is typically obvious right away. In just a few minutes, water can leach into ceilings and walls, saturate fabrics, and bring contaminants into your home. Often, it only takes minutes for water to cause discoloration, which is often impossible to eliminate without full replacement. If you allow water damage to persist for hours on end, you will see even worse damage. Furniture in contact with water will swell, delaminate, and change colors. Fabric dyes will begin to bleed, staining materials around them. Finally, after hours of water damage, stink will increase dramatically as the humidity releases trapped odors and encourages foul-smelling bacteria to proliferate. Water ignored for days begins to cause serious and irrevocable damage. For example, anything made of wood will cup and warp, and wood floors immersed in water will be unsalvageable. Paint and wallpaper will blister and peel away from the wall, and many surfaces will begin to grow fungi – including toxic black mold. Though you might not see it, the structural elements of your home might begin to swell and split, making it incredibly dangerous to continue occupation. It’s improbable that any invested homeowner would allow water to persist for weeks because homes that endure weeks-worth of water damage are uninhabitable. 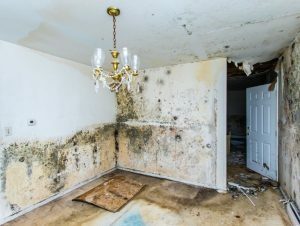 After weeks of growth, mold will sink deep into the home, destroying the integrity of walls, floors, furniture, and more. Standing water will become a breeding ground for exceedingly dangerous organisms, including giardia and cholera. If the water is not eliminated soon, it could cause the entire home to collapse. 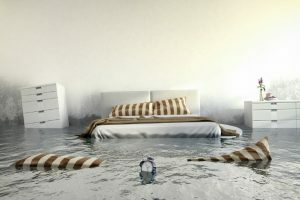 If the water damage in your home was impossible to stop before widespread devastation occurred – for example, if you were the victim of a natural disaster, like a hurricane or flood – you might wonder whether it is more cost-efficient to fix your current home or pack up and move somewhere else. After such an event, it is imperative to hire professionals to inspect your home as soon as possible. As shown above, the longer the water sits, the more damage it does. In truth, a house that is strong and stable before a water-related disaster isn’t necessarily destroyed, especially if you are able to drain the water from the premises relatively quickly. Likely, you can salvage your home by removing damp drywall and allowing the insulation and framing throughout your home to dry out. During this, you should also consider replacing appliances and electrical boxes, especially if your home was deluged by salt water. Almost everything with fabric will need to be exchanged because proper cleaning costs more than buying new. Sometimes, the damage is too complete. Fortunately, you can learn from your water damage experience and buy a home with new plumbing that is far from flood zones.